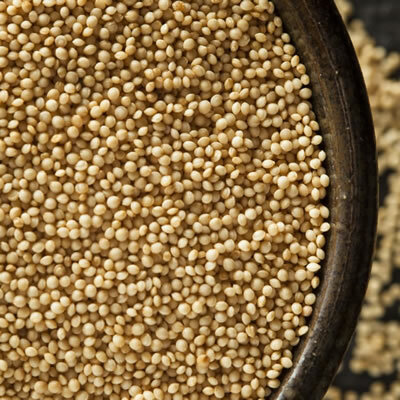 Amaranth flour is a specialty flour derived from the amaranth, a plant native to Mesoamerica that’s cultivated throughout North and South America. In tortilla formulations, it was used, in part, to replace nixtamalized corn flour, which resulted in an increased nutritional profile for the final product without significant sensory changes. Paredes-Lopez, O. Amaranth Biology, Chemistry, and Technology. CRC Press, 2018.
International Rice Commission Newsletter Vol. 48, FAO of the UN, www.fao.org/docrep/t0646e/T0646E0b.htm#Amaranthus cruentus, Amaranthus hypochondriacus. Last accessed 10 December 2018. Wrigley, C. W., et al. Encyclopedia of Food Grains. 2nd ed., Academic Press, 2016. pp. 287-296. Malin, S., and L. Nilsson, editors. Starch in Food: Structure, Function and Applications. 2nd ed., Woodhead Publishing, 2018. pp. 530-531. Suas, M., and F. Wing. Advanced Bread and Pastry: a Professional Approach. Cenage Learning, 2012. pp. 152-153. Mandala, I., and M. Kapsokefalou. “Gluten-Free Bread.” Flour and Breads and Their Fortification in Health and Disease Prevention, 2011, pp. 161–169., doi:10.1016/b978-0-12-380886-8.10015-7.